(Newser) – Not long after 12-year-old Tamir Rice was killed by police in Cleveland in November, a group of students in nearby Akron decided protests weren't enough. So the Akron PeaceMakers, an anti-violence youth group, brainstormed with the local PD to come up with a double-sided crib sheet of tips for kids to follow when interacting with cops, NPR reports. 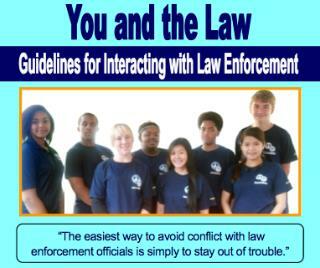 The "You and the Law" cards, set to be doled out to all Akron middle school and high school students—and possibly to adults, and internationally, in the future—feature 15 bullet points outlining "basic rights and responsibilities," as well as suggestions to ensure safety during an encounter. "Do not 'bad-mouth' or walk away from the law-enforcement officials," "control your emotions," and "do not resist arrest for any reason" are some of the tips. The top of each card mentions the "easiest way to avoid conflict with law enforcement officials is simply to stay out of trouble." Hands up, don't shoot. Pants up don't loot. Sound advice. After the article told me the police themselves were involved in telling the public the dos and don'ts, this sounds like a good idea. Nobody is perfect, including cops, but if an officer wants to be arbitrary with a suspect at least the suspect can bring up his/her compliance with the rules in court.